Belvedere, Fire Island's premier accommodation, located on the bay front at Cherry Grove, near Fire Island Pines, a few minutes from one of the world's best beaches. Custom home Builder and Contractor serving fire island pines and cherry grove. Count on the professionals at C.F. Lafountaine for top-notch plumbing services and repair. Whether you want an upgrade on your appliances or renovations done to your bathroom, our company has the services for you. Coastline Freight & Charter provides year round freight transportation services to and from Fire Island. The Communities of Fire Island Pines And Cherry Grove areserviced on a schedule basis all year round. Coastline Freight can deliver any item directly to your Fire Island house Mondaythrough Friday. d.katen fire island properties, ltd. have consistently been voted number one in professional real estate service in The Pines. The owner/broker, Doreen Katen, is a year round resident and native of the island. Fire Island Day Tripper's Storage is the only business located on the island solely dedicated to the safe, secure storage of you property. Water Taxi service for Fire Island. Landscaping and Gardening for your Pines or Cherry Grove Home. MS Drywall & Paint Inc. has been in the business for over 20 years. We are a licensed and insured company that provides quality workmanship in many areas such as interior and exterior painting, drywall specialist, water damage repair, power washing, wood staining & pickling and faux finishing. MS Drywall’s extensive list of satisfied customers is avail upon request. Serving Cherry Grove and Fire Island Pines. Fire Island Pines ~ Fire Island NYEstablished In 1967 Over 40 Years Serving The PinesServing : Prime Meats ~ Fresh Fish ~ Live Lobster ~ Gourmet SandwichesThree Generations: Ed ~ Annie ~ Brian ~ Matthew"Sell Only The Best!" Peter's Motto Still Lives On! Great wine selection so-so spirits collection.Great staff.Prices can be a bit steep compared to mainland standards. The Pines Marina can accommodate a wide variety of boat sizes and provides water and electric service for each slip.The harbor is located in the center of the Pines, within a short walk to the beach, restaurants, bars, night clubs and shops. Slips are available for the season, weekend, week or hour. All your Dress-up & party needs in one place. We carry everything from $10. beach towels to $600. evening gowns, asprin for the hangover-to adult toys, late night candy munchies, & cigs.Plus our Birthday Dept. B'day cards, candels, balloons, decorations,ect.. Great gifts for you or a friend. Amust see store in Cherry Grove located in the Grove Hotel. 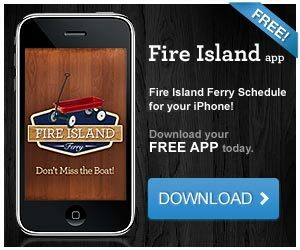 Water Taxi and Ferry Service to Fire Island PInes and Cherry Grove. Gifts, Clothing, Sun Glasses, Beach Accessories, Jewelry, Video/DVD Rentals.